Actually Visa took one for the blog, but that isn't what matters here. 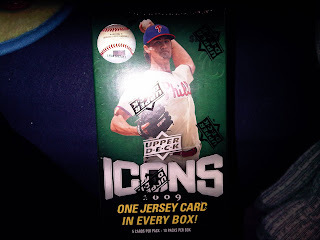 What matters is that Target was absolutely exploding with products when I went Friday night (yes, I spent my Friday night looking for baseball cards like a nerd). 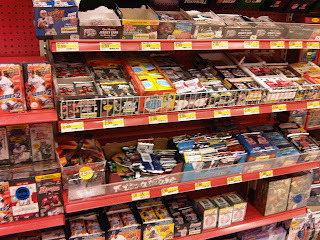 This Target had roughly 3 boxes of many, many products opened and ready for rummaging (might I add, there had been no searched boxes all were neat and appeared to be just put out), and blasters as far as the eye can see which is roughly 4 or 5 deep on the shelves. I was so excited I could have done a cartwheel if I knew how. I really wasn't crazy about any of the packs because I am over UD Series 1&2 because I have the cards I want out of there with the exception of YSL, and Stadium Club retail=boring, Heritage ehhh been there done that. But the blasters were where it was at for me. 2009 UD Icons was an instant impulse grab, then upon further inspection on the 3rd shelf (yes, 3 completey full shelves of all kinds of blasters), in the second row I saw the 2009 O-Pee-Chee that I just can not stop buying. I need to stop because it seems like the only cards I end up with that I need out of these are the black cards, and like 6 base cards which isn't that great. I did pull a GU Jersey out of my last OPC blaster so that was cool. I also had a couple of coupons which I was able to use yet again making the Icons purchase a little easier to do. I know what you're thinking, but you knew what you were getting by the title, "A Cardboard Problem". It wouldn't be a problem if I had self control. 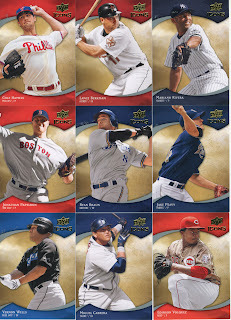 There were 10 packs, 5 cards per pack in each blaster with "one jersey card per box" promised. Here are some of the highlights, as well as a bit of an annoyance. In the first 3 packs I ended up with 5 Yankees, which made me super happy. 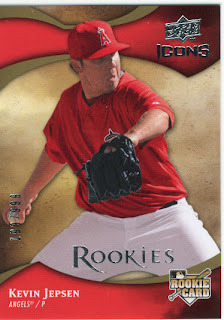 Jeter and A-Rod were in one pack, Joba and Mo in another, and Wang by himself. There was a Vlad silverboard parallel. 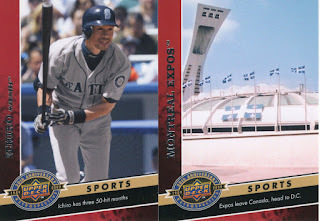 2 UD 20th Anniversary cards that I could have done without and traded for a Pujols. 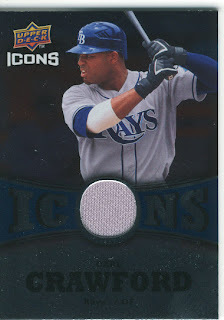 A Carl Crawford Icons GU Jersey card. Now, here is the annoying part of this purchase. Several of the cards have silver where they aren't supposed to. It's not silver from the wrapper, but looks like silver from the card itself like it was smeared or hit the machine a second time. It is kind of annoying for the money, and since you only get 5 cards per pack it's a little hard to shrug off this many plus 3 others that weren't as noticeable. I know it wasn't from the wrapper because not all of the cards were on top, nor is it shiny silver but flat silver. So there you have it, folks. Will I buy another one of these? Absolutely not. Why did I buy it you may ask yourself, well because it was to have a little fun and show everyone what they look like and what could come out of a blaster. I did enjoy opening it, but the damage on the cards is annoying me, and I'm not sure if I like the design. 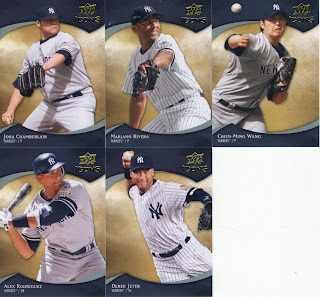 I am very impressed with getting 5 Yankees in the box though no Pujols... Go figure. 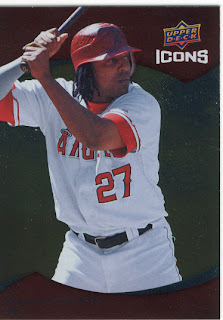 I wonder if I sent UD all my damaged cards and asked for just a Pujols in return if that would happen. If you all aren't overly sick of OPC I will post that break later. I have been hiding some of the breaks for fear of everyone running far away. Could you use AJ Burnett, CC Sabathia, and Phil Coke (677/999)? Did you pull any Twins? I'm doubting it. Only Mauer and Morneau made it to the base set. They look kind of blah to me. I'm glad yo posted that break. Not only will I not buy them because I don't like the design an overabundace of yankee cards will scare me away just as easy. I'm looking forward to the O-Pee-Chee break. Not becasue I want to see the design rather becasue I like the design (actually my favorite set so far this year) but because I want to see the cards. At least you get a relic for the $20. Nobody values them quite as highly as I do, but I'm sure I'll end up with a blaster of this stuff in a moment of weakness! The cards alright, no more or less appealing that 90% of what's out there already. It's no feat to pull Yankees out of this product. I've seen a few breaks of Icons and there are Yankees all over the place. I bought a blaster myself (just to see what they were like). Six Yankees. Far more than any other team. topher, no Twins but I am missing those Yankees you have. This set did nothing for me, just scratch the itch for 5 minutes basically. I'm willing to trade pretty much anything but Yankees for Albert from this set. Well, keep me in mind for any A&G inserts that I need, and of course any Twins OPC that I'm still craving. I'll send off your Yank-mes this week. just FYI on this one, I also got 5 Red Sux cards that will probably end up packed up and shipped shortly so they are out of my sight. Is this the Target at the Palisades center? I have two by me and they stink like yesterday's fish. Paul, this was the one in Spring Valley. I stopped by the Palisades Center today and they were equally stocked and had 09 Allen & Ginter blasters which they didn't have in the other one. Gonna need to take a road trip. Route 59 in Spring Valley I'm guessing. You got it. You should e-mail me and let me know what you collect, Paul. We seem to live close enough to trade easily, unless it really is a road trip to SV. Not really that much of a road trip, Paramus to SV. Ya, im not to crazy bout Icons. Did you pull any Reds players besides the Edison Voluqez is the picture?